I really enjoyed creating the house and table flowers for this very special dinner at Cowdray House in October. It's an amazing time of year to be a florist as there is such wonderful material to work with and bringing the outside in as the days grow shorter is always appreciated by the guests. I designed this dinner to come alive after dark when the candles were lit to create a real 'wow' factor. I used layers of candlelight that would illuminate the flowers, seedheads and grasses and although I didn't manage to photograph the table when the candles are lit I have seen photos that were taken that night; it really did look gorgeous and the feedback after the dinner was fabulous. Autumn wreaths are now incredibly popular and this week we've been making lots of gorgeous autumnal heather wreaths for orders. Our red and orange wreaths decorated with seasonal foliage, rose hips, physalis and seed heads are still popular but the demand for our pink, red and chocolate wreaths, inspired by the heather woods where I live in Midhurst, West Sussex, has been very high indeed. We've also been making some beautiful dried wreaths which will last throughout the year. I love making the dried wreaths and they look beautiful propped on the mantelpiece or hanging on doors around the house. This will be the last week for our autumn wreaths as we've been working on our Christmas collection which we'll launch at Cowdray Farm Shop on Saturday 2nd December when they're holding their Christmas tasting day. If you'd like to order a wreath for collection or delivery do get in touch! I was invited to design the flowers by The Admirable Crichton for a private party who were staying at Cowdray House for the weekend. 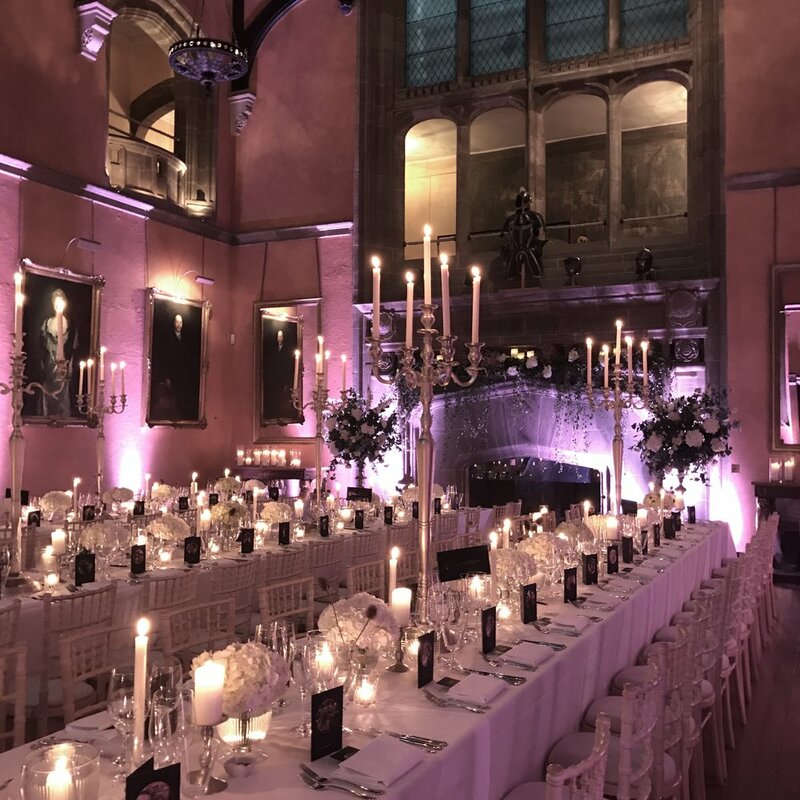 The dinner on the Friday evening was held at Cowdray Ruins, a place I absolutely love. It's a blank canvas with regard to flowers as it is all wonderfully old brick and dirt floors. A simple green fern theme with wonderful grey linen cloths, green water glasses and lots of candlelight was requested by The Admirable Crichton and the result was simply beautiful. Greenery is super fashionable at the moment but it doesn't always work in any setting. On this occasion, without any green grass or garden to compete with the green stood out against the red brick and with a simple vase of white foxgloves, fern and orlaya on the bar and a couple of vignettes of white foxglove plants and candles the Ruins came alive and was ready for a sensational dinner. Last Friday I had the pleasure of providing the flowers for a summer polo event at Cowdray House on Cowdray Estate. Hosted by Cowdray Polo Club with catering by Caper and Berry there were canapés on the lawn followed by a dinner in the dining room of cowdray House. I brought in some wonderful rhodendendrons from the gardens of Cowdray House and decorated the tables with seasonal peonies, aquilegia, hellebores, lilac to name a few of the ingredients. Its always a pleasure working at the fabulous Cowdray House! The annual fund raising event for the Brainwave charity took place at Cowdray House last week and I provided the seasonal flowers for the delicious lunch which was provided by the wonderful Jacaranda Catering with fabulous wine provided by Nyetimber.